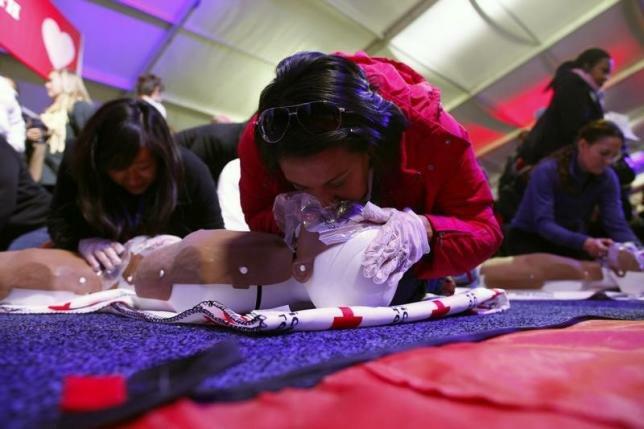 WASHINGTON – (Reuters Health) – Having a bystander perform CPR before a rescue team arrives more than doubles the odds of surviving cardiac arrest, according to one of two new studies from Sweden in the New England Journal of Medicine. The second report found a cell-phone-based system that alerts trained volunteers when someone nearby needs CPR can significantly increase the chances of a victim getting immediate help. Many people are trained in CPR and “if we can send these volunteers to the right place at the right time, we may finally improve rates of survival after out-of-hospital cardiac arrest and realize the public health potential of bystander-initiated CPR,” Drs. Comilla Sasson and David Magid of the University of Colorado School of Medicine said in a Journal editorial. Cardiac arrest strikes about 420,000 people outside a hospital in the US each year. Another 275,000 such cases occur in Europe. The first Swedish study found that while 4 percent of the 14,869 people who didn’t get CPR survived for 30 days after their cardiac arrest, the rate rose to 10.5 percent for the 15,512 who did. “We have clearly shown that CPR is a life-saving procedure” and the results should “encourage people to intervene if they are in that real-life situation,” study coauthor Dr. Jacob Hollenberg, head of research at the Center for Resuscitation Science at Karolinska Institute in Stockholm told Reuters Health. Not surprisingly, when the researchers looked at the time between a patient’s collapse and the start of CPR, the 30-day survival rate was highest when CPR was begun within three minutes of collapse. The highest 30-day survival rate – 21.6 percent – was among people who collapsed away from home with CPR initiated within three minutes. The rate was just over 19 percent among patients under age 73 who were treated within three minutes; it was 11 percent for older patients who received prompt attention. The team also found that emergency calls tended to be initiated faster when bystander CPR was done, which may be an indication that trained bystanders recognize cardiac arrest faster, they said. The second study, involving four of the same researchers, was designed to help in that effort. It looked at the effectiveness of having a system that used mobile phones to alert people trained in CPR that someone within a third of a mile (500 meters) had collapsed. When the system was used, 62 percent of 305 patients got CPR before EMS workers arrived. When the system wasn’t activated, the rate of bystander-initiated CPR was 48 percent for 360 patients. The system, which ultimately had 9,828 volunteers, did not produce a significant increase in 30-day survival. However, the study didn’t have enough cases to definitively resolve the question of whether such a system could prevent deaths, said Svensson, who is also with the resuscitation center. Hollenberg said the system now has 14,000 volunteers and it is being enhanced with better GPS technology and the ability to tell a person where to find the nearest defibrillator, a device designed to shock the heart into beating properly.